The concept of freeze-drying is simple — the evaporation of water directly from ice. However, the machinery and controls to accomplish freeze-drying are very expensive and challenging. Most of the 20 raw materials that Seagate processes are freeze-dried in the Ensenada factory. This method very gently removes the water, leaving the valuable nutrients and phytochemicals in the raw materials. 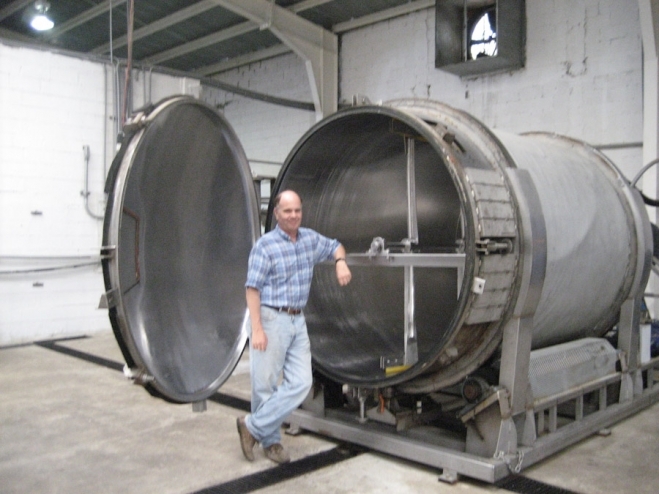 The photo above with Richard in front of the newest of Seagate’s rotary stainless steel freeze-dryer tanks provides a perspective of the size of this tank. It is 6 feet in diameter and 12 feet long. Depending upon the material being processed, it will hold between ½ metric ton and 1.5 metric tons filled to half the capacity. The tank rests on a series of rubber wheels that allow it to slowly rotate, thereby tumbling the material contained inside and allowing for a more effective rate of evaporation in the vacuum. Most freeze-drying equipment that can be purchased ready-for-use is very expensive, priced out of reach by the pharmaceutical industry which has unlimited budgets. 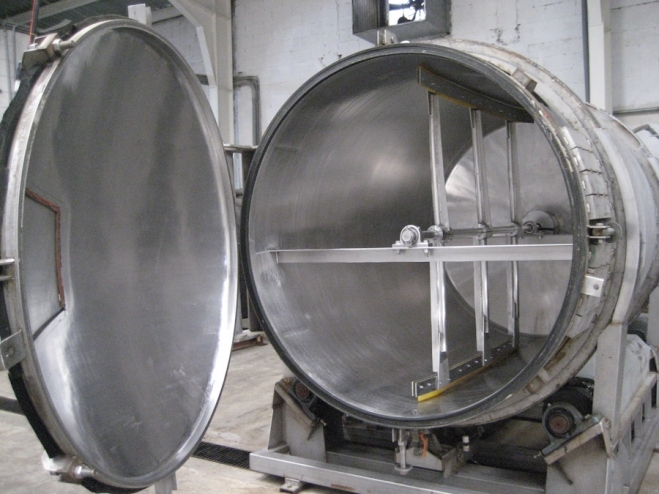 With the exception of the pumps and electrical controls, Seagate designed and built all of the tanks and process machinery seen in these photos in order to both save money and have each item custom-made for our specific application. The above photo shows the interior of the freeze-dryer with its large door opened. The paddles that connect to the center shaft allow it to agitate the raw material and keep if from forming into clumps in so that the surface area of all the product in direct contact with the vacuum, while the main tank moves through its rotation. The back end of the freeze-dryer tank contains the controls, the vacuum piping, heating coils, rotary seals, and the center shaft that connects to the inside paddles. The controls on the back end of the dryer regulate the rotation of the shaft attached to the paddles and the tank, and maintain a constant temperature inside the vacuum chamber. Every raw material has its own unique requirements of time, temperature control, agitation, and rate of evaporation. 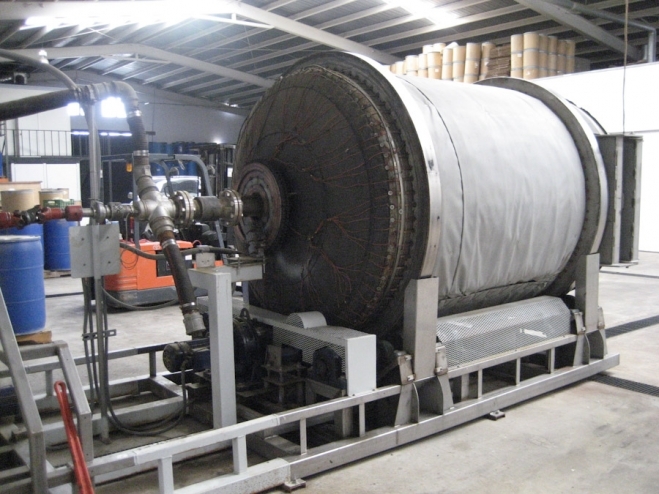 The second principle component of the vacuum drying process is the vacuum pumps. These pumps will initially remove all the air from the freeze-dryer tanks at the beginning of the process, and then continue to remove the water vapor released from the product during the 2 to 3 days that are required to evaporate all of the moisture. Seagate has 5 vacuum pumps installed, allowing for excess capacity in case of maintenance or repair. The three pumps in the photo above are rotary oil-sealed pumps. The many different hoses connected to the pumps may look like a spaghetti dish but actually perform different functions such as suction and discharge of the vacuum along with oil filtration and oil overflow regulators. The final piece of machinery involved in freeze-drying is the condenser tank shown in the photo above. Our friend Jose, who is the plant production manager is obviously having a difficult time opening the door so that you can see inside in the picture below. These tanks have refrigeration coils that cool the water vapor being removed from the freeze-dryer tank and cause the vapor to cool and condense into water. The condensers protect the vacuum pumps from being overwhelmed by the 1 to 1.4 tons of water being evaporated from each batch of product. The tank below with its door swung open during maintenance shows some of the refrigeration piping and plates that cool the water vapor. Actually, we really just asked Jose to open the door so that you could take a look inside. A typical batch of product requires two to three days to dry. A series of sensors and controls regulate the process. This freeze-drying process equipment runs automatically 24 hours a day without the need for coffee breaks or vacation time. With the freeze-dryer loaded and the process running on automatic, it is time to go for a dive. This friendly creature was swimming by at a depth of 100 ft. Fortunately he was not very hungry today. Okay, just kidding. This fellow was a 7 foot nurse shark … and nurse sharks don’t have teeth. The most dangerous injury that he might cause is a giant hickey. However, the 100 foot depth and the darkness at this depth are real. One diver accompanying us on this dive did sustain decompression sickness (a.k.a. “the bends”) due to the depth and excessive nitrogen absorption .. . and spent that night in a hyperbaric chamber.